When we consider the “three refuges” one can do so in a conventional sense, an empirical sense, and an absolute sense. This blog will reveal the ultimate realization of the three refuges. The Absolute Buddha is the Dharmakaya, or the Source-Principle that Illuminates the Buddhadharma. Absolute Dharma is the Doctrine of Illumination itself. The Absolute Sangha are those Self-realized Ones (Noble Ariyans) who partake in the mystical-union of the One That Illuminates and the Doctrine that is the ongoing cultivation of Illumination Itself. The Ratna next presents these refuges, firstly in a conventional and empirical manner, then ultimately as the Absolute Refuge. Now, for what purpose and for the sake of whom did the Lord teach the 3 Refuges (śarana-traya)? Three Refuges were taught [by the Lord] [in 3 forms]. 3 Vehicles: In this context the Three Vehicles represent the separate teachings and practices for Śrāvakas, Pratyekabuddhas, and Bodhisattvas. This is in regard to the Empirical Standpoint. *Religious observance: for the sake of those who, though they have not entered the Path, are still devoted to the performance of the acts of religious observance, worship, &c., in regard of each of the 3 Jewels respectively. (Obermiller footnote) Hence, this is in reference to the Conventional Standpoint. The Motives for the Establishment of the 3 Refuges from the Empirical Standpoint as explained by Āryāsanga. In order to show the virtues of the Teacher, with a View to those individuals who adhere to the Vehicle of the Bodhisattvas and wish to attain the character of a Buddha, as well as those who, (though they have not entered the Path), are devoted to the performance of religious Observances which have the Buddha for their object, it has been spoken and ascertained:–the Buddha is the refuge, since he is the Highest of Men. In order to make known the virtues of the Doctrine, for the sake of those who belong to the Pratyekabuddha Vehicle and start an activity for an independent apprehension of the profound Doctrine of Causality, as well as those whose religious fervour is directed toward the Doctrine (exclusively), it has been declared—The Doctrine is the Refuge, since it is the highest for those who become dispassionate. In order to show the virtues of the Disciples, who have embraced the Doctrine of the Teacher, with regard to the individuals who adhere to the Vehicle of the Sravakas and proceed on the Path in order to attain (the fruit of Arhatship) on the basis of the instructions heard of others, as well as those who are devoted to the worship of the Congregation, it has been proclaimed—The Congregation is a refuge, since it is the highest of communities.—Thus, in short, for 3 motives, and having in view 6 kinds of individuals, the Lord has proclaimed the 3 Refuges and shown them in their variety. This has been done in order to promote the living beings to the 3 Vehicles respectively, the matter being viewed from the Empirical standpoint. § 2. The Doctrine and Community are not the Ultimate Refuges. Are ultimately not the highest Refuge. This is a reflection of the conventional and empirical paths. Conventionally, the rudimentary teachings of the Dharma at some point will need to be abandoned, as the Ratna says, like abandoning a raft after use. The two-fold realization of the Dharma, conventionally, will also eventually subside since it constitutes a changing nature. Hence, the cessation of these lesser paths do not constitute the ultimate and changeless quality of the Absolute. In like fashion, the sangha of the conventional three-fold vehicles are still in early formation stages and cannot exhibit levels of development that constitutes an understanding of Buddhahood that is free from fear and uncertainty. Only the Ultimate Buddha-refuge (Dharmakaya) is free from these vicissitudes of samsaric-reality. Definitively, only the Dharmakayic-refuge is the ultimate completion of freedom from all fear and attachments that deter one from Liberation of Mind and Spirit. And because in that the Community sets the ultimate goal. 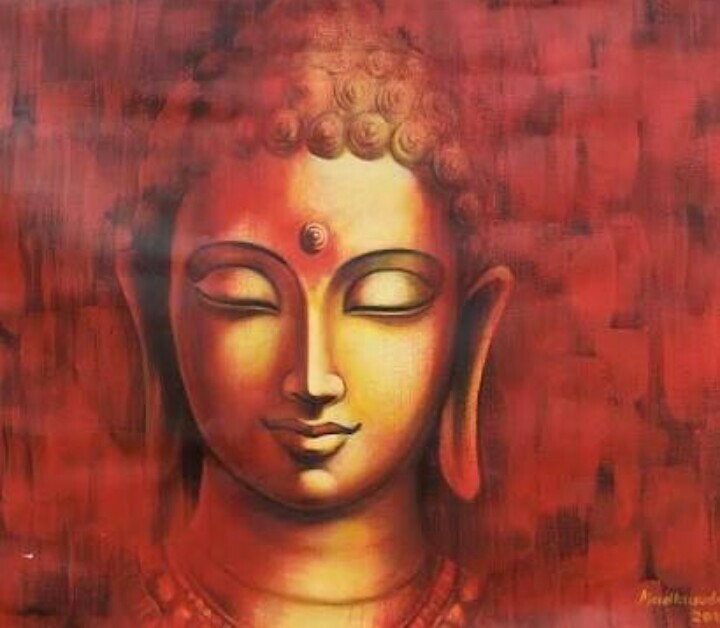 The Buddha, as has been said before, is characterized as neither becoming originated, nor disappearing, and is endowed with the Cosmical Body which represents the deliverance from passions and bears the character of the 2 purifying Truths [nirodha and mārga] (of the Saint). The Congregation of the Saints belonging to the 3 Vehicles, too, attains its final goal, when it has coalesced with the ultimate, pure Cosmical Body. Therefore, for the living beings who have no other protection and refuge, the Imperishable Refuge that is like a last instance, the Eternal Refuge, the Indestructible Refuge, and the Absolute Refuge is only one—It is the Tathagata, the Arhat, the Perfect Supreme Buddha. Obermiller breaks this down as the only refuge, in the absolute sense, is the Dharma-Lord who is possessed of the “Cosmical Body” (Dharmakaya); the Bodhisattvas, too, “have their issue” therein. Thus, the Buddha is the inexhaustible, the permanent, and immutable refuge. Yea, this Dharmakaya-Buddha is the Deathless one. And being the highest and unchangeable. A [wish-fulfilling] jewel is difficult to find. Its essence is free from defilements. It possesses the power to fulfill needs and wishes. Due to its beauty it becomes an adornment. It is more sublime than an artificial gem and it does not change through being praised, blamed, and so on. This entry was posted in The Ratnagotravibhāgaśāstra and tagged Absolute Refuge, conventional and empirical paths, Dharmakaya Buddha, Rosemarie Fuchs, Three Vehicles. Bookmark the permalink.